The year 2017 has drawn to a close and it’s been an eventful one in the UFC. 537 different fighters entered the Octagon to partake in 457 fights, resulting in 145 TKO/KOs, 81 submissions, 165 unanimous decisions, 60 split/majority decisions, 5 draws, 5 No Contests and 1 DQ. In this column, I’ll take a statistics-based look at some of the winners, losers and general trends of 2017. Most Fights- Aljamain Sterling, Chase Sherman, Cynthia Calvillo, Jason Knight, Ovince Saint Preux, Sam Alvey + Walt Harris (4). Most Wins- Belal Muhammad, Cynthia Calvillo, Darren Till, Felice Herrig, James Vick, Li Jingliang, Ovince Saint Preux, Paul Felder, Paulo Costa, Rafael dos Anjos, Raphael Assunção, Santiago Ponzinibbio, Tecia Torres, Thiago Santos + Volkan Oezdemir (3). Most Losses- Anthony Hamilton, Bobby Nash, Darren Stewart, Donald Cerrone, Henrique da Silva, Jim Miller + Nate Marquardt (3). Most KO/TKO Wins- Paul Felder, Paulo Costa + Thiago Santos (3). Most KO/TKO Losses- Bobby Nash (3). Most Submission Wins- Antônio Carlos Júnior, Brian Ortega, Cynthia Calvillo, Demetrious Johnson, Kevin Lee, Michel Prazeres, Oleksiy Olinyk, Ovince Saint Preux + Zabit Magomedsharipov (2). Most Submission Losses- Chris Gruetzemacher, Darren Stewart + Will Brooks (2). Most Unanimous Decision Wins- Alexander Volkanovski, Aljamain Sterling, Belal Muhammad, Brad Tavares, Carla Esparza, Colby Covington, Darren Till, David Teymur, Elias Theodorou, Felice Herrig, Jeremy Kennedy, Jéssica Andrade, Jordan Johnson, Leon Edwards, Rafael dos Anjos, Santiago Ponzinibbio, Scott Holtzman, Sergio Pettis, Tecia Torres + Tony Martin (2). Most Unanimous Decision Losses- Albert Morales, Angela Hill, Artem Lobov, Court McGee, Demian Maia, Holly Holm, Jared Cannonier, Jenel Lausa, Jim Miller, Kailin Curran, Louis Smolka, Marcel Fortuna, Nate Marquardt, Sam Alvey + Terrion Ware (2). Most Split/Majority Decision Wins- Pat Cummins + Raphael Assunção (2). Most Split/Majority Decision Losses- Andre Soukhamthath, Eric Shelton + Rashad Evans (2). Most Performance Bonuses- Brian Ortega + Justin Gaethje (3). Most Times Missing Weight- Marcos Rogério de Lima (2). Most Fight Withdrawals- Antônio Rogério Nogueira, Bryan Caraway, Christian Colombo, Damian Grabowski, Felipe Arantes, Ion Cutelaba, John Phillips + Sheldon Westcott (2). Highest Dwyer Score of the Year- UFC 211: Miocic vs. dos Santos II + UFC 217: Bisping vs. St-Pierre (+45). Lowest Dwyer Score of the Year- UFC Fight Night: Holm vs. Correia (-14). 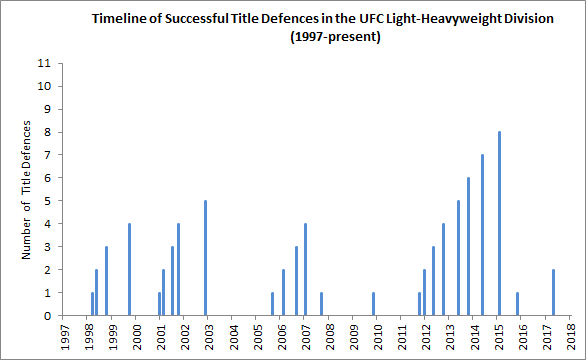 Here’s a graphic which shows the timeline of successful UFC title defenses made in all weight classes since 1997, updated to include all results in 2017. As this image is a little clustered, here are the individual images for each division: Heavyweight, Light-Heavyweight, Middleweight, Welterweight, Lightweight, Featherweight, Bantamweight, Flyweight, Women’s Featherweight, Women’s Bantamweight, Women’s Flyweight + Women’s Strawweight. 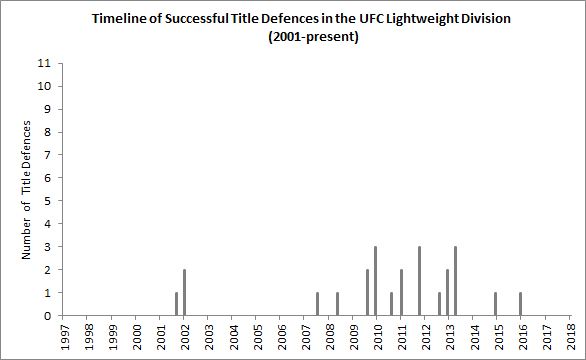 This graphic shows the average winning streak that a fighter needed to put together before receiving a title shot against a reigning UFC Champion. 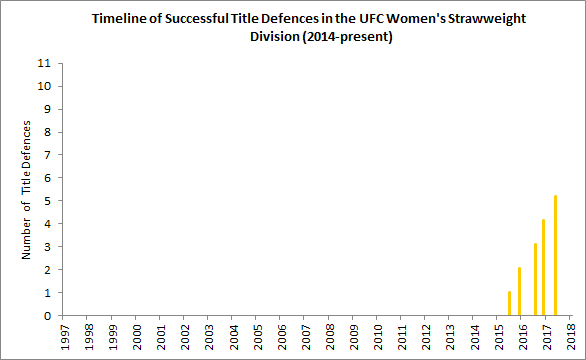 As you can see, fighters in 2017 needed to put an average streak of 3.93 wins together before they earnt a chance at UFC gold, which is behind only 2009’s average streak of 4.5 wins. 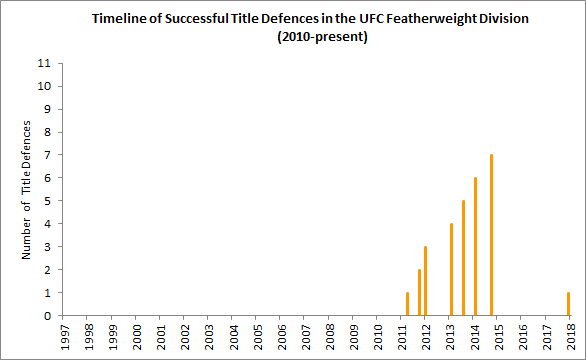 This graph displays the average number of successful title defenses per reigning UFC champion. 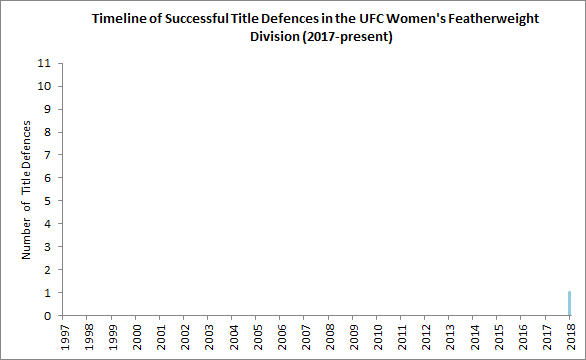 We’re on something of a slump at the moment, with champions like Joanna Jędrzejczyk and Michael Bisping losing their belts recently, after a generally positive 2017 in terms of reigning UFC champions’ dominance. 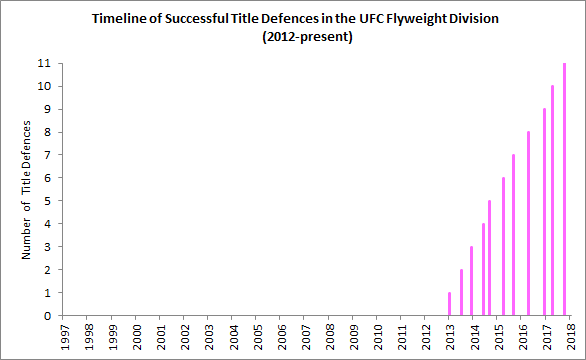 This graphic shows the number of days taken for a fighter to reach two UFC wins in a calendar year. This year was the first time a female fighter was the first to reach that mark, with Cynthia Calvillo recording her second UFC win 97 days into the year on April 8th. 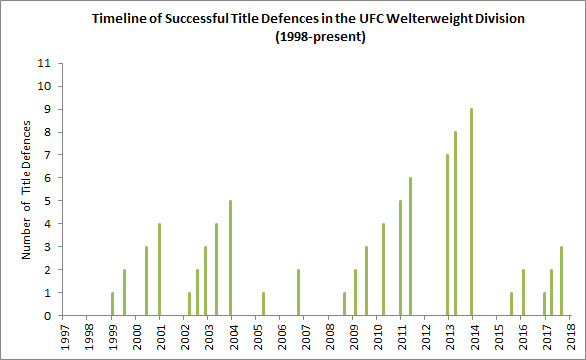 This graph shows the number of reigning UFC interim champions at any time between 1993 and today. 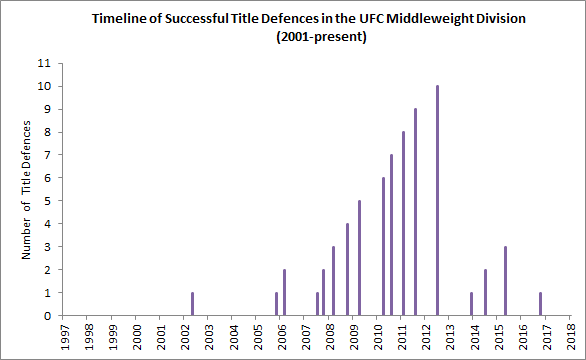 The UFC has introduced 14 interim titles in total- the first 7 were introduced over 21 years, whilst the second 7 were introduced over 3 years. 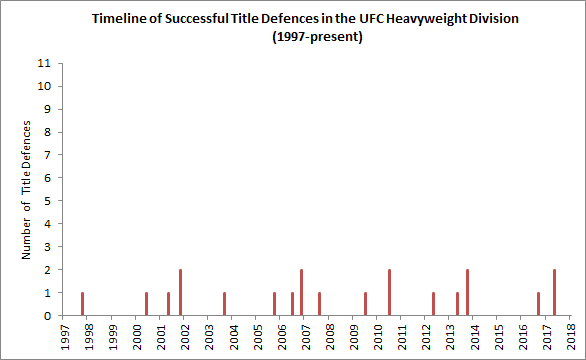 These two graphs, both updated to include interim titles introduced in 2017, show how many interim titles were introduced each year and which weight divisions those titles were introduced in. 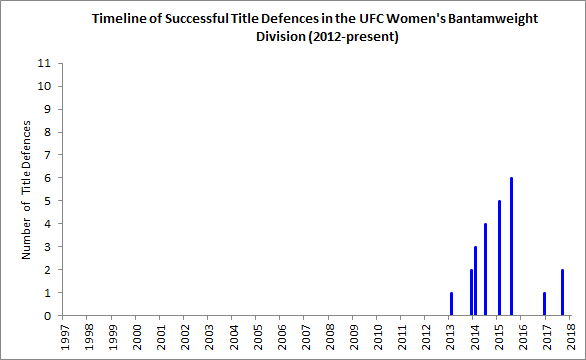 There has yet to be an interim champion crowned in any women’s division. 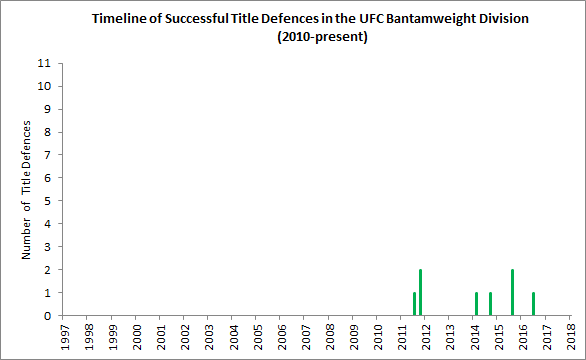 There have been 8 unification bouts (interim champion vs. undisputed champion) in UFC history, with interim champions getting the better of undisputed champions 5 wins to 3 in those match-ups. This year saw just 1 unification bout, with interim champion Max Holloway defeating undisputed champion José Aldo back in June. That wraps up my statistical review of 2017. Here’s to many more fights and statistical analyses in the coming year.